"Make Hawaii-style ahi poke wherever you are. Here's a recipe." 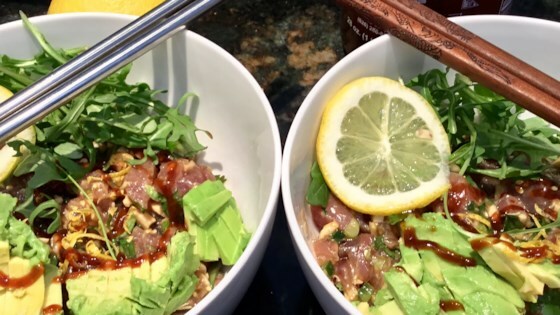 Combine ahi cubes, soy sauce, Maui onion, green onion, chile pepper, sesame oil, sesame seeds, macadamia nuts, ginger, and sea salt in a large bowl. Substitute yellow onion for the Maui onion if desired. Consuming raw seafood may increase your risk of foodborne illness, especially if you have certain medical conditions. Quick, simple and DELICIOUS! The only variations to this recipe that I made were using Hawaiian red salt in lieu of sea salt, going heavy on the sesame oil, and I added a a little sriracha.